If you haven’t seen it, in yet another hilarity of American politics, a turn of phrase has gone mad. From my own vantage point, there is very little that could slander the springtime goodness of asparagus. Tender young shoots erupting from earthen beds ready to be sautéed, grilled or roasted. The healthful qualities of these gems not only fight against obesity and disease but also against any vilifications cast their way. Except perhaps one. There are some people who smell a distinct sulfuric odor in their urine after consuming asparagus. But this doesn’t happen to everyone and further, there are some who produce the odor but cannot smell it. The latter is referred to as a specific anosmia – an inability to smell one particular odor. Marcia Pelchat from the Monell Chemical Senses Center in Philadelphia has found that specific anosmia is linked to a variation in olfactory genes. While we’ve called it out for asparagus, Pelchat believes that each one of us all have a few of them and therefore, we are all living in our own scented sensory worlds. These olfactory genetics or smelling genes explain a lot. Someone in your house loves cilantro (coriander) but someone else thinks it tastes like soap. Things simply smell and taste different to different people. And, because of the thousands of smells that we are constantly coming in contact with, it’s no wonder that our senses check out on occasion. Because our tongues only taste four basic elements; sweet, salty, bitter, or sour, the majority of our food’s flavor is derived from its smell. Is there another link her to greater issues about how we view our world and differing points of view? Whether or not there is a connection, the bottom line is that each one of us has unique sensory experiences. If you and your significant other get a whiff of the same hot chocolate chip cookies wafting from the oven, you may be having two distinct smelling experiences. That individualism by itself suggests to me that no one should be casting aspersions on my asparagus! I prepare this mixture as if it was rice with olive oil and sea salt and water. It cooks easily in a microwave for those have a rice setting or on stove top. You’re certainly not limited to the grains that I have listed. Make this a great excuse to clean out the pantry. Once finished, this can be used as a side or as I do below in the base for a main meal. Warm the olive oil in a pan over medium heat. Add the onion and garlic and saute until soft. Then add carrots and asparagus and continue to cook until these vegetables are almost done. Add the spinach and stir it a couple of times. This will reduce quickly. Ladle in the grains and mix gently. Add about 1/4 cup of water and allow to heat through. Enjoy the white ones too Tandy! I also love green asparagus but prefer the white thikcer sweeter one’s, where Belgium is famous for,…What a truly alternative & appetizing dinner,…All vegan too! 🙂 MMMMM! I can’t wait to try it with a combo of green & white asparagus! This would be equally tasty with some grilled fish on the side! Double yum! I would like to try the white ones sometime. you never know from what source inspiration will come! we’ve been enjoying spears aplenty this spring. 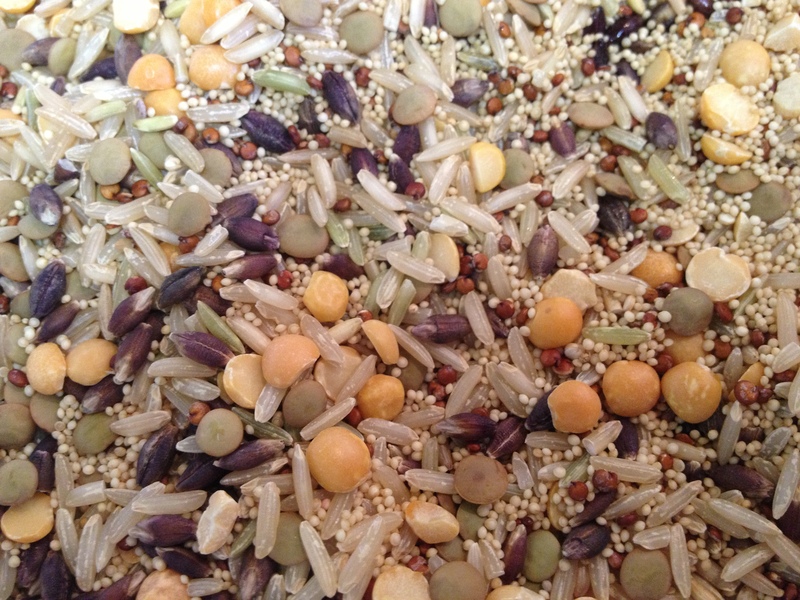 your recipe looks delicious–love the combination of grains. Did you see the video Nancy? I love asparagus ~ grilled, roasted, or steamed! But O it does make my P stink. And it does it instantly! 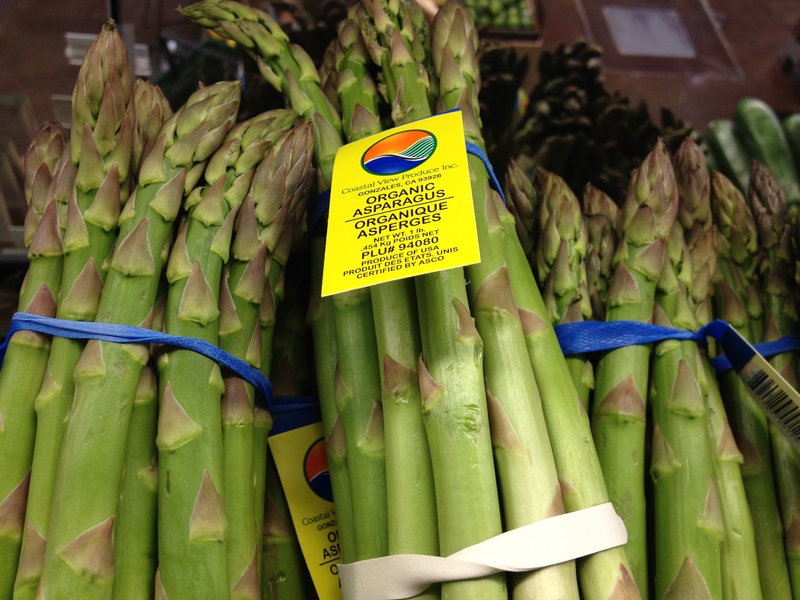 Another miscellaneous asparagus fact: the amino acid asparagine was named after asparagus. Yes, I used to know that but had forgotten it. Yum, asparagus! My kids are funny, they don’t like the tips, so I get to eat them! LOL I think the tips are the best part. All the different grains you use make the dish so beautiful and a nice change from just rice. Yes, the tips are best. Fortunately, my kids love it. Love asparagus in any form. What a wonderful sign of spring! We love it roasted, sauteed, stir fried and baked in a quiche! Do you ever grill it? Not yet, but we have kabob skewers, so we’ll try it! I love asparagus! It’s something I never had growing up, but now we eat it all the time. 😉 Well, when they are nice, thin spears in season. What’s your favorite way to prepare them Carrie? If you haven’t read Animal, Vegetable, Miracle I think you would enjoy it. Barbara Kingsolver has a great description of getting her asparagus beds ready. I agree wholeheartedly. Glad to enjoy your speaking up!!! I would never cast aspersions on your asparagus, that recipe sounds delish. Excellent point about the odor! I remember getting that same asparagus smell after eating Tofurky deli slices – there must be some in there. Interesting about the Tofurky. I also used to hate it as ours was prepared similarly and then there’s that kind from a can. Asparagus rocks pickled too. I used to pick it wild on the banks of the Columbia River in Central Washington. Fantastic. Then buy 100#s locally and pickle it. Delish. But any of the multitude ways of prepping wonderful and yet,….They do stink! You are on the money with nutrition, so that out numbers odor! Yummy looking dinner there, Tammy. I really like it pickled if it’s a bit spicy. Do you grow it Linda? I love asparagus, and this recipe sounds like a wonderful use for it. Thank you, Tammy! Yum! 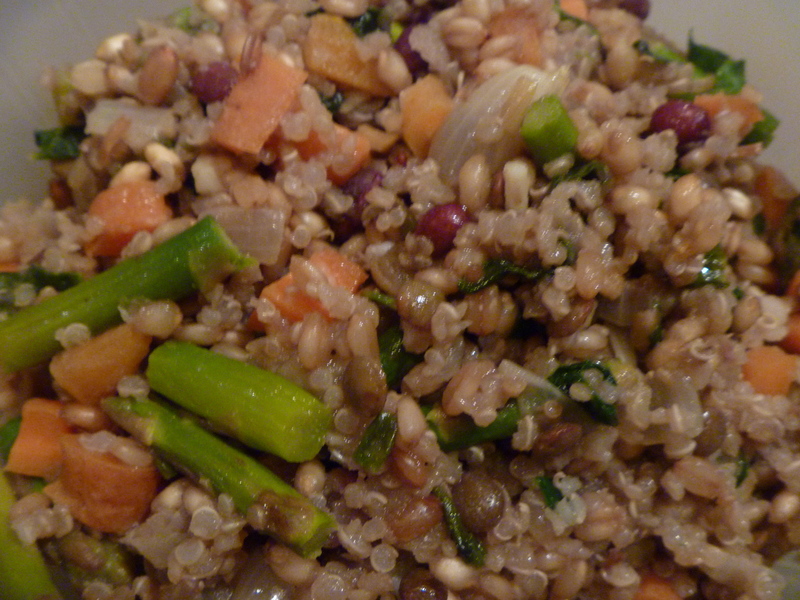 I love asparagus, and am always looking for more ways to incorporate whole grains into our diet. Thanks! I really like it in eggs too Camille. I love meals where I throw a bunch of stuff together in a pot. it’s always so much fun. Thanks for a yummy looking recipe and a smile on my face! I suppose it could look like birdseed! i love asparagus but is very expensive in my Country. Right and with colour blindness, we know this is the case. I think it’s a good lesson for our children, don’t you? Well… strange but true. But starting an asparagus patch is one of my life goals. It grows wild here if you are lucky… but it looks like we will need to take matters into our own hands (which somehow sounds vaguely political as well, doesn’t it). For inspiration, read Kingsolver’s book. She makes it perfectly romantic. I love Asparagus too. Goes well with any dish. lately its fish and asparagus for me. And my children enjoy it too! Think I’ll try a farro and asparagus stir fry tonight. A nearby farm has a great crop of asparagus this year, almost gone! “Aspersions on my asparagus”…I don’t even know how to take that! This recipe looks delicious, I’m going to give it a try this week. I’ve been on a string bean run so asparagus will be a nice treat. Thanks for the information! Did you watch the video? It was one of the silliest comments ever! Love string beans too. Thanks for your visit. I like to use asparagus in quiche and stirfry too. Once I tried to grow asparagus, but I let it go too long… and the fern was really quite nice. Yes, you have to get asparagus at the right time or else it is tough and woody. Great post about my favorite veggie! (even thought it DOES make my pee smell!). Recipe sounds intriguing – thanks! You know, I went years before realizing that asparagus was what was causing that. Does everything cook evenly if prepared like rice with all those difference size grains in there? I’ve noticed a difference just between brown and white rice, so I’m wondering if it ends up with crunchy bits? No. You have to decide how much you care. For example, the lentils that I throw in get over-done but other than that, there hasn’t been a bit issue. I also throw this is the microwave when I’m in a hurry. Hahahaha! I love asparagus, especially the green one! 🙂 Peter and I have eaten it a couple of times, but now the season is over again already, and I can only buy the white kind. Boo. Yes, our season has also passed. So glad I found your site, supporting CSA! Yiiiipppppeeee! I’m so glad you did too! If you have questions or need support, just ping me. Happy to help everyone use their CSA. I LOVE asparagus. Boy, these recipes sound and look delicious. Thank you for your blog, where I’ve learned so much about foods and life.